Popular Thai beauty and personal care brand Snake Brand presents Prickly Heat Cooling Powder Classic. This cooling and soothing powder is suitable for all skin types and is great for taking care of your face and entire body. It has a refreshing, cooling, antibacterial, deodorising, and soothing effect. Cooling powder is an essential in Thailand’s hot and wet climate. It effectively relieves itching, heat rash and skin irritation, making your stay in a hot climate much more bearable and comfortable. Snake Brand is renowned for creating the world’s first cooling powder. The formula of cooling powder was developed in 1947 by Dr. Luen Vongvanij of The British Dispensary (L.P.) Co., Ltd, the company that owns Snake Brand. The product was specifically designed for foreigners who suffered from heat rash from the humid and hot climate of Thailand. Prickly Heat Cooling Powder Classic is the original cooling powder that has a light, fresh smell. You can use Snake Brand Prickly Heat Cooling Powder Classic anytime and apply it to various parts of the body (arms, legs, neck, armpits, delicate areas). It is very easy to use and keeps your skin dry for a really long time, effectively preventing heat rash, itching and irritation. The powder also has a pleasant cooling effect. Directions. Prickly Heat Cooling Powder is usually used after bath or shower as an absorbent and antiseptic dusting powder, but you can use it anytime. Apply freely to dry skin and spread evenly to make your skin feel fresh, cool, dry and clean. Suitable for everyday use. Can be applied as often as you want. No age restrictions. Ingredients. Talc, Kaolin, Camphor, Perfume, Menthol, Triclocarban, Cl 77491, Cl 77492. 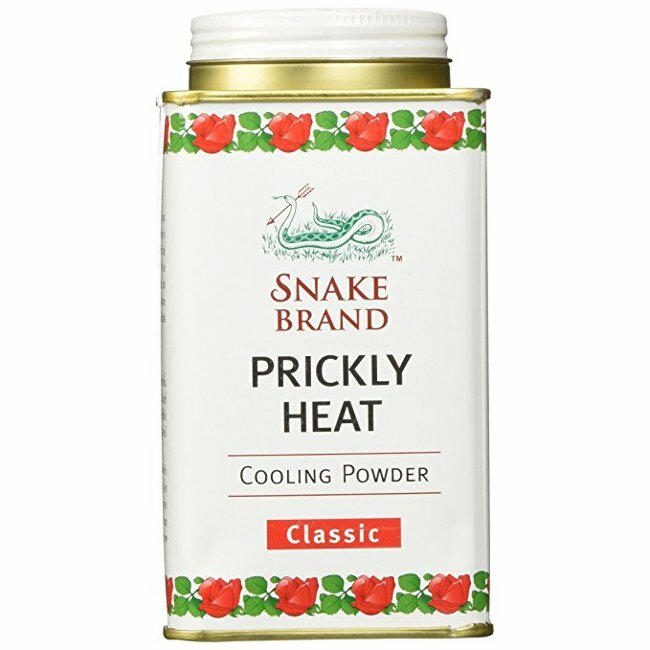 Want to buy Snake Brand Prickly Heat Cooling Powder Classic? Call us or submit your order via our web site! The Kingdom of Thailand has a burgeoning cosmetic market, but many products are produced for local consumption and therefore are hardly known abroad. Nevertheless, there are Thai beauty brands that enjoy international popularity, to a certain extent thanks to tourists from all over the world who buy their products as souvenirs while vacationing in Thailand. These brands include Madam Heng, Pond’s, Prim Perfect, Green Herb, ISME Rasyan, and others. A lot of Thai beauty brands have a long history. For example, one of the best known cosmetic manufacturers in Thailand is Madame Heng. The company was founded in 1949 and originally produced natural soaps based on family recipes. One of Madam Heng’s most popular products is Merry Bell Soap Bar. The company also produces other kinds of soap as well as high-quality oils and oil-based lotions. Another well-known cosmetic company from Thailand, TP4 International Co., Ltd., was established in 1990. It owns several brands, including ISME and Rasyan. The company produces natural cosmetics based on Thai herbs. All its products comply with the ISO 9002 requirements and are GMP (Good Manufacturing Practice) certified. Pond’s is an American-Thai skincare brand owned by Unilever. It was founded in 1846 by American pharmacist Theron T. Pond who invented herbal tea that he named Golden Treasure. The tea had a healing and strengthening effect on the skin. Very soon the product became widely known as the Pond’s Extract. Pond’s small enterprise has since grown to become one of the world’s best known cosmetic brands. Some of its products such as Magical Powder are made in Thailand using local ingredients and are branded as Thai cosmetics. Of course, there are many more Thai cosmetic brands and manufacturers. Despite their differences, they have several things in common. Thai personal care products are formulated with natural ingredients according to traditional recipes and do not contain synthetic colourants, fragrances and preservatives. That’s why Thai beauty products are so popular around the world.